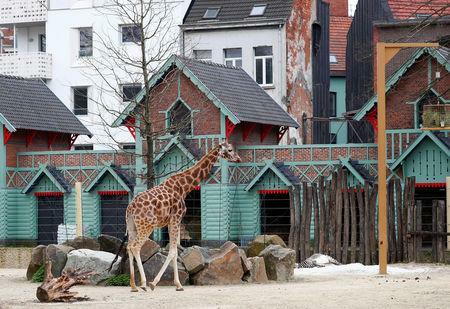 ANTWERP, Belgium (Reuters) - Amid all the hand-wringing from businessmen and politicians about potential risks from a 'no-deal' Brexit, zookeepers are worried too - especially for a group of rare forest giraffes. Seventy-three "okapis" - an endangered species from the Democratic Republic of Congo with a brown body and zebra-like striped legs - live in zoos in the European Union where free movement rules underpin an inter-country breeding project. "Brexit is very bad news for conservation breeding," he told Reuters at the zoo, as elephants munched behind him. "Fifteen out of my 73 (okapis) are in the UK. You can imagine that if I need to remove these 15, it would be a big blow for my population but it would be even worse for the UK colleagues," he said. "It's very difficult to plan an elephant transport. You can imagine how difficult it will be if you don't even know what paperwork you have to deal with, or what port you have to go through," he said. "I actually have no clue."